If you want to become a welder in Wisconsin, you should know that this career has an amazing outlook and there are lots of welding schools in the state. In other words, it’s an absolutely rewarding job that will provide you with a stable good income. 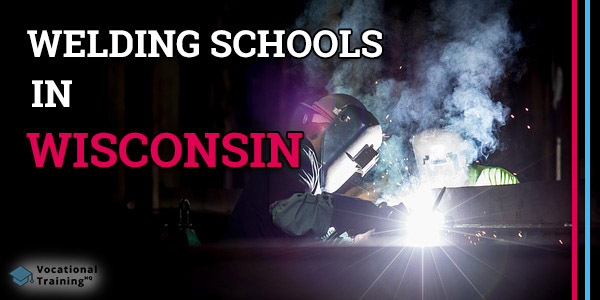 In this article, you can find a list of the best welding certification schools in Wisconsin. Also, there is a bunch of useful tips and facts. 2 How to Become a Welder in Wisconsin? Choosing a future career, it’s important to understand what salary you can earn. That’s why we’ve prepared some statistics for you. A medial welder’s salary throughout the country is about $39 390 per year or $18.94 per hour. At the same time, a medial welder’s salary in Wisconsin is $41,910 per year which is $20.15 per hour. The top 10% of welders throughout the USA can earn about $62 100 per year while in Wisconsin they make about $53 180 annually. How to Become a Welder in Wisconsin? If you want to become a welder, you should begin by getting your certification. To accomplish this task, you need to enroll in one of the available programs. During your training, you’ll learn a bunch of skills attending classes and hands-on training courses. As soon as you complete your training, you’ll be asked to pass the American Welding Society (AWS) certification test to prove your proficiency. Keep in mind, there are lots of locations where you can take your test. Nevertheless, in most cases, you can pass it in the school you get your training at. This section contains the table with a list of the best welding certification schools in Wisconsin. There you can find not only the names and locations of these schools but their contact info as well. Consider the fact that you can look for better career options as soon as you get enough experience and improve your skills. Keep in mind, that all schools in the list above provide a bunch of other technical courses. There is plenty of options that are rather similar to welding. Keep in mind that there are lots of welding schools in Wisconsin. Just take your time and learn more about the available programs. Use the info from this article and do your best to achieve your successful career.